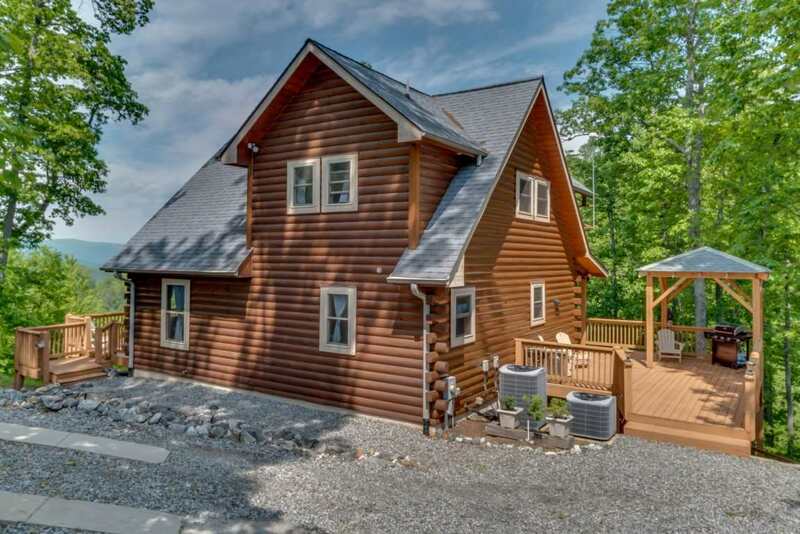 Best Buy In Bostic - Log home living on three levels in Yellowtop Mountain Estates, Bostic NC. 3BR/2.5BA, 4.49 Private Acres. Inspiring views. Upstairs MBR with a jetted tub, walk in shower, walk in closet and Juliette balcony. Perfect for entertaining the main floor is open with a living room, dining room and kitchen. Honey wood floors, cabinets and surfaces contrast with blue accent walls as inviting as a Carolina sky. Floor to ceiling glass windows offer sweeping views of the South Mountains. This cabin does well on the rental circuit (3 years rental history to qualified buyers). Two bedrooms on the lower level share a living room, bath, and a full deck. This home rents frequently to traveling families, groups of friends and occasionally couples. This is the only cabin at the end of the paved cul-de-sac. Not too far from the airport, Charlotte and Greenville and Asheville are within an hour and a half. With I 40 to the North, I 26 to the West, I 85 to the South and I77 to the East, you're not too far off the beaten path. Beat the stress of a too full life and enjoy a regular disconnect. This cabin offers a perfect place to get away from it all, at the end of a cul-de-sac with a fifty acre parcel on either side. It is a real retreat. Guests pen messages in the lodge's guest book, mostly they write, âI didn't want to leave, â you won't either. Feature Remarks: Lovely Mountain Views All Around. Brighton Is A Ridge Running Road You&apos;ll Enjoy The Views On The Drives In And Out And From The House As Well.